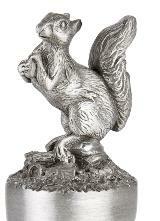 Squirrel bottle stopper is a favourite amongst many wildlife lovers made from finest British Pewter in Birmingham, England. Finely created by hand this piece has a matt finish, showing off the fine detail of this animal. A great gift for anyone who needs to add a little something different to the top of their bottle. Lovely item... the perfect gift for nature lovers! It came in a nice gift box too with a card about the company which I think is a really nice touch. I'm looking forward to giving it to my partner on his birthday. I know he'll love it!